Treat your taste buds to the best of autumn with this utterly delicious autumnal Lamb Rump recipe created by our head chef, Ross Chatburn. 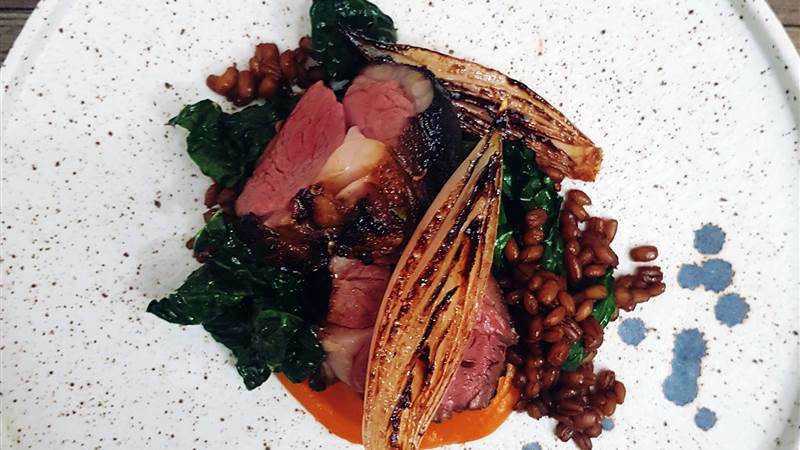 Lamb Rump – sweet potato, roast shallot, braised barley. Mix the treacle, salt, chopped rosemary, coffee and fennel seed in a bowl thoroughly. Coat rumps in marinade and set aside. Soak the barley for a couple of hours before cooking. Once soaked, finely chop the garlic and place in a saucepan over a medium heat with a touch of oil. Cook for 2-3 minutes, stirring regularly. Next, add the barley to the pan, stir thoroughly, add a little salt and cook on a medium heat until the barley is tender, around 15-20 minutes. If you have any trim from your lamb, rendering the fat and adding it to the barley can give you lots of extra flavour! Place the sweet potatoes on a baking tray an roast at 180 degrees for around 45 minutes until the sap starts to leak from the sides. Half the potatoes and scoop out the flesh. Put the flesh, maple, salt and a little grated nutmeg into a food processor and blitz for around 5 minutes until smooth and glossy. Half the shallots, being sure to keep the skin on. Heat some oil in a frying pan and place the shallots flat side down in the pan, leave them to caramelise on a low heat for about 4-5 minutes. Once your shallots are golden brown and smell sweet and nutty, add your butter and allow to melt and begin to foam. Leave for around 1 minute before adding your sugar. Cook again for 1 minute and add wine and vinegar. Turn up the heat and cook until your liquid is reduced to a shiny glaze. Remove the shallots from the pan and discard the skins. Heat some oil in a frying pan on a medium heat, place lamb rump fat side down and render the fat for 1-2 minutes, turn the lamb and repeat on all sides to achieve a slightly charred crust to on the meat – the lamb may blacken slightly but that is just due to the caramelised sugars in the marinade. Don’t worry, it adds a beautiful flavour. Place the frying pan into the oven for 5 minutes, then remove and rest for a few minutes before plating. The shallots can go into the pan with the lamb to re-heat if needed. Blanch your cavolo nero in boiling seasoned water before adding to a pan with a small knob of melted butter to glaze the vegetables. Heat your puree gently in a microwave, then spoon a good amount onto the centre of the plate. Slice your lamb in half, place one piece flat side down on your puree. Make a small pile of your cabbage at one side and lean the other piece of lamb on to it. Top the dish with your shiny, sweet shallot, serve and enjoy! You can add a jus to the dish you wish but the sweet potato should sauce the dish sufficiently.